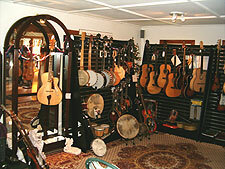 Mockingbird Music Company provides expert repair service for your instruments. From basic set up to complete restoration, we can make your instrument everything you expect from a quality instrument. Our focus is on craftsmanship and beauty, but most of all ... sound. Mockingbird Music will donate 5% of the proceeds from any wind or stringed instrument repair to the music program at the Massachusetts school of your choice through September 29th. Please let us know which school you wish to support.